"Ohmygod," she laughed during the ode to her exes. Ariana Grande has had quite the year. The 25-year-old dropped a new studio album Sweetener, got engaged to Saturday Night Live comedian Pete Davidson earlier this year (and broke it off just last month), and her ex-boyfriend Mac Miller passed away after an overdose in September. 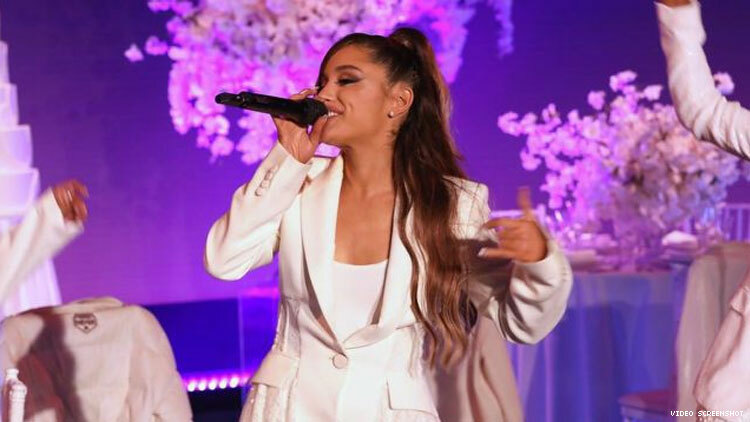 Last weekend, the 25-year-old dropped a surprise ode to her exes, entitled "thank u, next," and just yesterday, she gave an emotional performance of the track on Ellen DeGeneres' talk show. The song begins,"Thought I'd end up with Sean/But he wasn't a match/Wrote some songs about Ricky/Now I listen and laugh/Even almost got married/And for Pete, I'm so thankful/Wish I could say, 'Thank you' to Malcolm/'Cause he was an angel." Dressed in white and sandwiched between two backup dancers, Ari channels First Wives Club for an on-stage kiki. At one point in the adorable performance, Grande tries to hop off a chair and almost trips and falls. "Ohmygod," she laughs as she catches herself, then continues right on with the song. And during the emotional bridge of the song ("One day I'll walk down the aisle/Holding hands with my mama/I'll be thanking my dad/'Cause she grew from the drama"), Grande chokes up with tears in her eyes. Watch the heartwarming performance below!